“Colour is my life. Colour is my language, the expression of my true self“, says Sybille Berger. What this means for her paintings can be seen at the artist's first solo exhibition in Germany at Galerie m Bochum. The powerful, glowing horizontal bands of colour stretch across the large canvases and fill the rooms of Galerie m with an astounding presence. Sybille Berger, who was born in 1962 in Stuttgart, has been living in London since 1993. 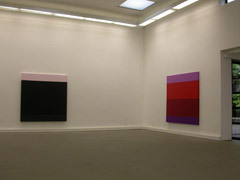 She divides the painting surface into either four or, in her most recent works, three horizontal colour bands. All of her canvases are of the same size, which allows her to focus her search for the greatest possible degree of variations within the painting itself. The size of the format she has chosen is also vital to the work's direct visceral effect on the viewer. Sybille Berger mixes her own acrylic paints from colour pigments, using a roller to apply these, layer by layer, onto the canvas, until they condense to form an even, perfectly smooth coloured surface. 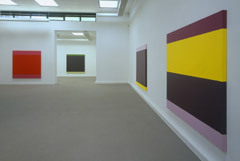 The deep density of the colour bands, consisting of at least 100 to 150 layers or more of rolled-on paint, gives them their own unique kind of corporeality. And yet, every trace of the process of colour application or other painterly act, that might distract attention from the colour itself, is eliminated in the paintings of Sybille Berger. The colour itself is all that's left behind as evidence. The artist is interested in the relationships between her colours, as well as the effect of each colour combination. She selects the colours for each painting intuitively. These colours make reference to aspects of her own identity and memories, to include reflections on the past and its echoes in the present. By excluding any narrative element and letting the work speak for itself, the colour takes on a reality outside of its own existence. It is both concrete and abstract at the same time, making an impact both as a physical and metaphysical presence. The viewers perception of clarity and demarcation, fragmentation and compilation, separation and attraction, thus goes beyond the mere visual impression made by the painting and colours themselves. In their extreme “emptiness“ as well as in the effect their colours exercise on our senses, Sybille Berger's paintings, despite their geometric severity and precision, speak to an intuitive receptive level within us, becoming like a projection surface for the observer.